In this paper, we study the logic of language of $ L(More,IA) $. The logic contains the quantifier called ‘’ more ‘’ which makes cardinality comparisons can not be expressed in the language of the first order logic. The sentence forms are basically the form of ‘’There are more y than x .‘’ with x and y being common plural nouns. The sentence forms of common plural nouns combined with intersecting adjectives are ‘’There are more b y than a x.’’ with the intersecting adjectives a and b. We focus on derivation algorithms of the sentences having this type of quantifier and algorithms of construction of counter-models when the derivations are not provided. Łukasiewicz, J. 1957. Aristotle's syllogistic from the standpoint of modern formal logic, Oxford University Press Academic Monograph Reprints, 222p. Moss, L.S. 2010. Intersecting adjectives in syllogistic logic. In The Mathematics of Language (pp. 223-237). Springer Berlin Heidelberg. Moss, L.S. 2016. Syllogistic Logic with Cardinality Comparisons. In J. Michael Dunn on Information Based Logics (pp. 391-415). Springer International Publishing. Moss, L.S. and Topal, S. 2017. Syllogistic Logic with Cardinality Comparisons, On Infinite Sets. arXiv preprint arXiv:1705.03037. West, D.B., 2001. Introduction to graph theory (Vol. 2). Upper Saddle River: Prentice hall. Van Rossum, G. 2007, June. Python Programming Language. In USENIX Annual Technical Conference (Vol. 41, p. 36). Topal, S. 2017. L(More, IA) Lojiğinin Python Uygulaması. http://pbs.beu.edu.tr/s.topal/docs (Erişim Tarihi: 15.05.2017). Çevik, A. 2012. Hesaplanabilirlik kuramı ve Turing derecelerine giris. Gaziosmanpaşa Bilimsel Araştırma Dergisi, sayı 1, sayfa 1-20. Çevik, A. 2013. Antibasis theorems for classes and the jump hierarchy. Archive for Mathematical Logic, 137-142. Çevik, A. 2016. choice classes. Mathematical Logic Quarterly, 62(6), pp.563-574. ISNAD Topal, Selçuk , Akünsoy, Yasin . "Inference Situations, Counter-Model Constructions and A Computer Implementation of A Logic Composed of Intersecting Adjectives and the Quantifier “More’’". 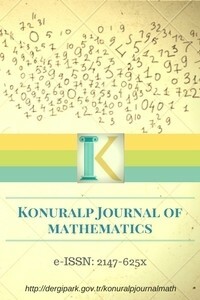 Konuralp Journal of Mathematics (KJM) 6 / 1 (April 2018): 1-6.